A call to Jordanna Joffe at International Yacht Collection confirms that the 25m motor yacht Andiamo has now joined the charter fleet, available year-round in Florida and the Bahamas. Built by Monte Fino in 2001, this yacht, says Jordanna, has a 'family friendly' layout of four staterooms in a master suite, VIP stateroom and a double and twin cabin along with two Pullman berths. Captain Kevin Bell and two crew should help your clients get the best of what the Bahamas has to offer. 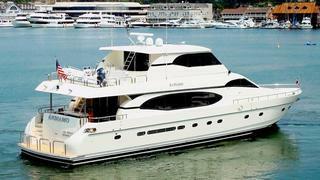 Based in Nassau until the end of August, Andiamo charters at rates starting from $25,000 per week.